Annual plan, paid monthly: $18/mo, renews optionally at $9/mo after the first year. Annual plan, prepaid: $180, renews optionally at $90/year after the first year. Join with a friend: $270 (second plan 1/2 price), each plan renews optionally at $90/year. Enter your friend's email here and we'll send him or her an email with a prepaid gift code. If you prefer to pay the yearly subscription in monthly payments you pay $216 for the whole year with monthly payments of $18 (you can cancel within the first 30 days, otherwise you will be responsible for all 12 payments of $18, a total of $216). Join with a friend is only available as a pre-paid subscription but you are getting two subscriptions for 1 1/2 which is $270. Annual plan, paid monthly: $18/mo - total of $216, renews optionally at $9/mo after the first year. Self-nourishment counselor, emotional eating expert and author Jeanette Bronée has ten years of experience helping clients overcome their struggles with eating while avoiding the restrictive nature of dieting. Her core belief is that when we focus on feeling healthy, vibrant, and nourished, weight loss is just a welcome side effect. This handbook offers a condensed guide to the first step in her path to self-nourishment. With a focus on basic food knowledge — including a lucid explanation of hunger and digestion and an in-depth guide to the foods and eating habits that will help you stay satisfied longer after a meal. 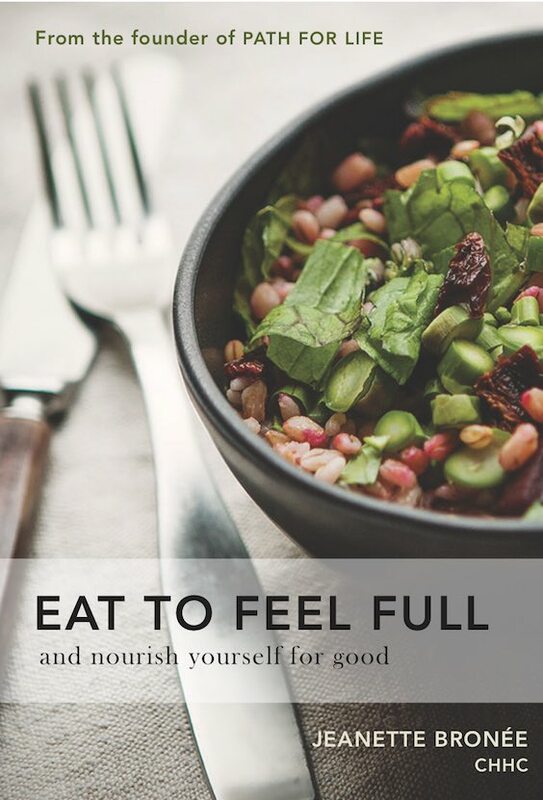 EAT TO FEEL FULL aims to help its readers feel better about eating, feel better after eating, and gain mastery of their appetites through an increased sense of well-being.